Once you have Conceptual Data Model, it further converted to Logical Data Model which is the actual implementation of Conceptual Data Model. Logical data model represents the entire business requirements of an organization. Logical Data Model describe the detail level information for subject area defined in Conceptual Data Model. LDM defines the subject area and all of its attributes needed for business. Also LDM represent the referential integrity between the subject area attributes. In short Logical data model includes all required business entities, attributes, keys, and its relationships which define business rules. 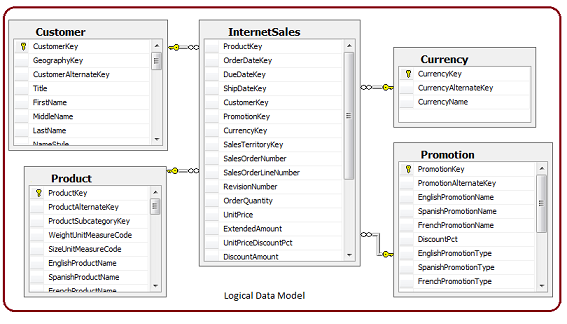 In the figure below represent the Logical Data Model which has entity names, attribute names, keys and relationships.